There has been a lot of discussion in the mainstream media about the role the Internet played in electing Barack Obama as the next President of the USA, but I haven't seen very much of it being focussed on the search engine visibility of the candidates and their campaigns. By Thursday, Obama had launched the change.gov transition portal, and transatlantic search engine guru Danny Sullivan was extremely critical of the search engine friendliness of the site in both an article and a string of Twitter messages. "Ugh. The title tag is the most important place where a site owner can directly tell the search engines what they are hoping to rank well for. For the new site, apparently, that’s just 'Change.gov.'" 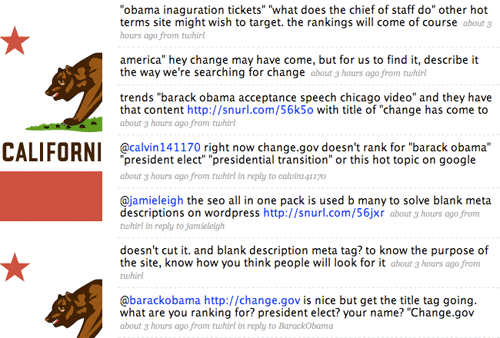 Danny also stresses how the Obama content strategy for the site should match what the public are searching for. "Along with title tags, you want content that’s relevant to a particular topic. That helps you go after other terms people are looking for, since no one page can match everything. Now remember this popular [Google Trends] term - 'barack obama transition team'? Somewhere, there should be a page on the site that answers this query. That means good content, and then the content helped by a solid HTML title tag reflecting those terms." There is an opportunity here for the mainstream media, but at the moment they still seem to be inflexible with their approach to specifically generating search engine friendly content in advance. I can guarantee that even as I'm typing this a small army of commercially focused SEOs and webmaster entrepreneurs are building sites for the search engine traffic that they know is going to appear on January 20th 2009. Search terms like 'obama inaugural address', 'president speech', 'obama transcript' will be driving a lot of traffic on that day. When the time comes, newspapers and TV stations around the globe will be producing the digital equivalent of acres of content around the inauguration. Which mainstream media site already has a holding page up, with an easy-to-link-to-URL, promising in-depth coverage? I bet none. But they could already be attracting backlinks, getting indexed, and associating their future content with the search terms that we all know will be topping the Google Trends chart that day. By Martin Belam on 8 November 2008. This article makes a really good point. Very few established media companies are forward thinking enough to hire someone who knows the ins and outs of SEO. One reason might be because it costs so much. But a truly good SEO consultant could make back their salary plus a lot more with optimized content on a site from a media authority.